An electric bus has covered over 1,000 miles on a single charge to claim a world record for driving the longest distance by an electric vehicle on a single charge. 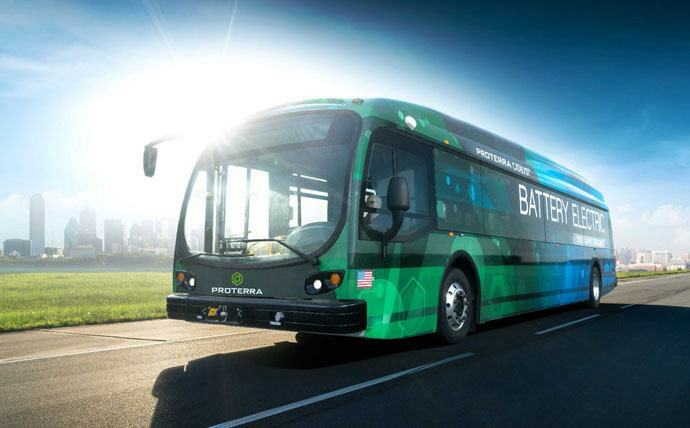 Proterra’s 40-ft bus squeezed 1,101.2 miles from 660 kWh of energy storage capacity. The creators of the bus hope their technology will have a disruptive impact on the transit market because of its low cost per mile compared to conventional fossil fuel-powered buses. According to Bloomberg New Energy Finance, lithium-ion battery prices have dropped by roughly 72 percent since 2010, and the economics for batteries continue to improve. “Driven by the best cost savings-per-mile, we believe the business case for heavy-duty electric buses is superior to all other applications, and that the transit market will be the first to transition completely to battery-electric powered vehicles,” said Ryan Popple, Proterra CEO. The electric bus is not a new idea. There was a time when many British towns and cities hummed with the sound of the trolleybus. Bridging the gap between trams and diesel buses, the benefits of the electric trolleybus include zero emissions on the street, very little noise, and powerful, smooth acceleration. And from the perspective of the operator, trolleybuses offer lower maintenance costs. Given their strengths, it’s a wonder we gave them up in favour of diesel-powered buses. Especially when you consider the damage caused to the environment and our health by diesel emissions. The pollution caused by diesel buses is compounded because the operators are dragging their heels when it comes to buying cleaner vehicles. A quirk of vehicle registration intended to allow one-off vehicles such kit cars to bypass certain regulations has been exploited in order to save money. Using Individual Vehicle Approval (IVA) to register a bus has proved a popular way of bypassing the latest emissions standards. According to the Society of Motor Manufacturers and Traders, which monitors registrations data, as little as four years ago, more than 80 per cent of buses and coaches bought in Britain failed to meet Euro 6 emissions standards. Euro 6 buses and coaches emit half as much NO2, the harmful gas linked to heart attacks, cancer and asthma. The centralised power stations used by electric trolleybuses on the other hand, have the potential to be far more environmentally friendly. Electricity derived from renewable sources, considerably adds to the advantages. Infrastructure costs for electric trolley vehicles equate to 10 per cent of light rail systems and only 20 per cent greater than diesel buses. If one takes into account the ‘environmental advantages, trolleybuses are the cheapest option. The trolleybus dates back to 1882, and an experimental demonstration in Berlin. It was 1911 before the first trolleybuses arrived in Britain. For much of its existence, the London system was the largest in the world. It had 68 routes, and a fleet of over 1800 trolleybuses. These were eventually all replaced with diesel vehicles. Currently, around 300 trolleybus systems continue to operate in countries around the world.